Should Americans Cross The Border To Get Artecoll For Acne? Artecoll is a filler for acne scars that has been available in Europe for about a decade and available in Canada and Mexico almost as long. It has become relatively inexpensive, just about US $300 per treatment at clinics conveniently located at the US border in Canada, and as little as US $100 per treatment in Mexico and Costa Rica. That’s a lot less than people who have acne scars will pay for their treatments in the United States. But is treatment with Artecoll a good idea? Artecoll can be used to treat acne scars, but some side effects occasionally occur. Artecoll is an injected filler for acne scars. It consists of about 75% beef collagen and about 25% PMMA (polymethyl methacrylate), the same substance that is used in many other cosmetic procedures for certain dental procedures and bone repair. Outside the USA, Artecoll is used for filling in wrinkles, folds, and scars. Artecoll works in a way that is completely different from Botox. Injections with Botox temporarily paralyze the muscles underlying the skin so that they cannot force the skin to wrinkle. The plastic microspheres of Artecoll hold beef collagen in place in the skin long enough to provoke an allergic reaction. The swelling of the tissue just beneath the skin triggered by the collagen, which later breaks down and is absorbed by the body, creates just enough swelling to erase a scar or a wrinkle. Or at least it does in most cases. Results are not visible for up to 3 or 4 months. How Long Does Artecoll Treatment Last? Botox treatments have to be repeated every 3 or 4 months. Injections with another popular filler, hyalouronic acid, have to be repeated every 6 to 12 months. Artecoll lasts up to 5 years, although it does not stop new wrinkles from forming if the sun is exposed to too much sun. Can Anything Go Wrong With Artecoll? The advertisements for Canadian Artecoll clinics will tell you that over 100,000 men and women of all ages have been treated with Artecoll in Canada, and only about 100 have suffered a serious side effect called granuloma. In these relatively rare cases the product generates too much inflammation, and the skin generates a lump, a knot, or a small area of skin discoloration that has to be treated with an anti-inflammatory drug or surgically removed. It’s possible to have a serious, systemic reaction to Artecoll, but responsible practitioners will give you a small test injection first to confirm that you do not have a strong allergic reaction to the treatment. Don’t have Artecoll injections if you have not been given the test treatment. So, Why Isn’t Artecoll Available In The United States? The clinical trials submitted to the US Food and Drug Administration showed conclusively that Artecoll gets better results than existing products. The problem was that of the 126 patients involved in these trials, 8 suffered mild to moderate granulomas (lumps) after getting the drug, about 1 in 15, instead of the 1 in 1,000 in the Canadian experience. One of the patients who had to get treatment for granuloma received Artecoll injected into the lip, an unapproved use of the medication. Only one of the 267 patients in the American trials had to have a surgical procedure to remove the tissue affected by the drug, but the FDA thought the overall adverse reaction rates were just too high. In the American clinical trials, Artecoll also caused persistent swelling, rashes that would not go away, flu-like symptoms in fewer than 10 patients, and oozing or drainage from the injection site in 26. One patient died during the study, although the death was not linked to the product. OK, I’m Not Going To Canada To Get Artecoll, What’s Available Instead? Laser resurfacing. The downside of getting laser resurfacing for acne scars is that some kinds of scars, such as ice-pick scars, just can’t be treated with laser resurfacing. The results take several months, and the procedure may have to be repeated a number of times. Each laser treatment is about twice as expensive than Artecoll, which is only done once. Injections of bovine collagen without the PMMA microspheres that hold it in place. Bovine collagen is “Jell-O” made from cow tendons. This procedure works in the same way as Artecoll, without the PMMA microspheres to hold the collagen in place so the skin fills in precisely as desired. Injections of human collagen, products such as Cymetra or Fascian. These products are made from collagen taken from human cadavers, with and sometimes without the consent of the family. Aside for the creepiness factor, human collagen has its benefits and its problems. The product works without inducing an allergic reaction. You get the “fill” as soon as it is injected. But the way this kind of collagen is injected, the dermatologist can’t necessarily see the injection site. It’s relatively easy to hit a blood vessel and cause a bruise. Plus, if you are allregic lidocaine, or if you take an anticoagulant like Plavix, you can’t have this kind of collagen injection. Injections of your own fat. The plastic surgeon withdraws fat from your hips or belly and injects them into the scars. Your body won’t reject its own fat. But it will, eventually, burn it. Fat injections only last a few months and aren’t appropriate for all kinds of scars. Microinjections of your own blood. In this treatment, the dermatologist draws your own blood, spins out the red blood cells, mixes the remaining plasma with calcium, and uses a micro-tattoo device to needle it into your face. The downside? The procedure makes a bloody mess, and very few doctors perform it. Each treatment is about $600. It’s also possible, of course, to manage your scars with makeup. But in the United States you can also get injections of a product called Artefill. You can get injections into acne scars with Artefill, it’s just not officially permitted. The use of Artefill for acne scars is off-label. That is, strictly speaking, Artefill is not approved for the treatment of acne scars. It is only approved for treatment of “smile lines,:” wrinkles of the naso-labial fold. But you may be able to find a dermatologist who will give you this treatment for your acne scars, and charge you a lot less than you would be charged for laser resurfacing. 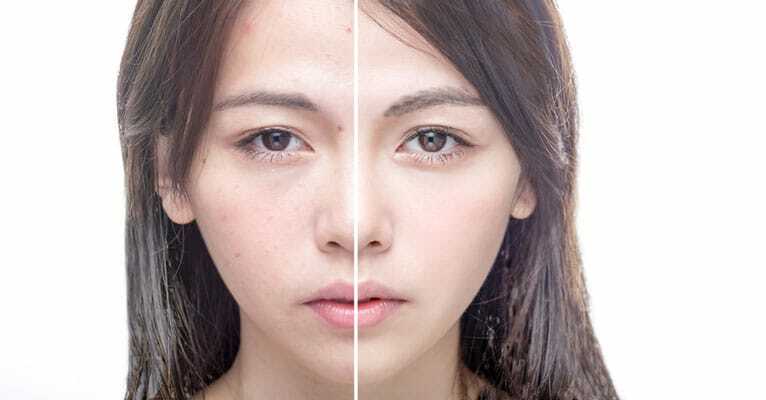 All the problems with Artecoll, however, may also occur with Artefill—and you may ultimately have to turn to other techniques of acne scar repair.